I don’t want to set myself up for failure, so I’m forcing myself to pick one area and really focus on it for the month. 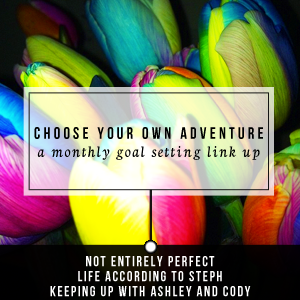 My blog-friend Steph is hosting a Choose your Own Adventure goals challenge, so I decided to pick a simple goal that goes along with their theme for the month (September — fitness), and actually try to do it for 30 days, instead of letting my jack-rabbit brain go off in a million directions. I’ll report back at the beginning of October to let you know how I did! This entry was posted in Fitness, Living intentionally by Sarah. Bookmark the permalink. looking fwd to the updates on your challenge. i’m a lover of 180 degree core workouts – they really do make a huge difference as it tones your entire core, not just your abs. I am getting a real education on what real core exercises look like. Color me clueless, all these years I thought sit-ups and planks were all I needed! Sticker charts FTW!!! I put a little smiley quake on my calendar when I work out. Anything to keep motivated! Hee hee — smiley quake is one of the better auto-corrects I’ve seen lately! I tend to accomplish my goals when I have a single-minded focus. I love that you narrowed your objectives to 2 exercise goals. Looking forward to hearing about your success in October. It’s still early in the month but I can already tell that narrowing my focus is going to pay off. Sticker charts make everything better! Good luck to you, lady, rock it. Thanks! And thanks for hosting such a fun link-up. Everyone loves a good (monthly) challenge, right? I love your September goal and feel sure that you will meet it!!! Plus, out walking will be a great way to see and hopefully meet people in your new town! Thanks! We are finally getting some cooler weather so I know I’ll be out walking and running as much as I can to enjoy it. Good luck, it’s totally doable! I’m setting a walking goal too, I just feel so lazy sometimes working from home every day. I want to see the sticker chart! I posted it on Instagram – I couldn’t find any stickers so I ended up just drawing a chart on a large index card and coloring in the lines for each day that I met my goal. Ooh – can’t wait to hear about your goal and how you do with it. Hope you had a good weekend, Iva. Hey let me know what you think of MuTu! I’m really interested in a whole-core program like that. It’s a good program, Marcie! I’d wait til you can get it on sale, though. It goes on sale?! I’ll have to keep an eye on it– thanks for the tip!! YAY! Your chart inspired a chart for me. How are you doing? I missed a few things over the weekend, but having only two related goals certainly makes it easier to focus on them. SONDA BRUCE recently posted…SEPT 5, ’14 ONE LOVELY BLOG AWARD!!!!!!!!! Thanks Sonda! I’ll check it out. Jack rabbit brain? I love the term and I can relate. I always say that I have way too many browser tabs open in my mind and that I want to look at them all at once. Glad to hear I’m not the only one! I’ve been checking out your new site, it’s very cool! I’m not really in a place where I have much time to learn new things right now (unless you want to start a podcast) but hopefully someday I’ll be able to put your great ideas into practice.